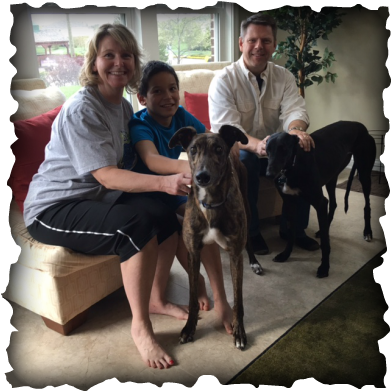 Gettn Back and Rico's Brewer were both adopted by this family in Lebanon who has talked about adopting for months, they wanted to adopt two greyhounds, after lots of research, a new fence, a new home they decided on Gettn Back, who is now being called Lady Valentina and Rico's Brower who will be called Rico. Pam, Mike and son, Alek will have FUN with these two hounds. We entered their home and Rico and Lady Valentina both started playing, Alek was playing right along with them.